Newsgur USA: Exactly what is expected from Diaz-Canel? Exactly what is expected from Diaz-Canel? 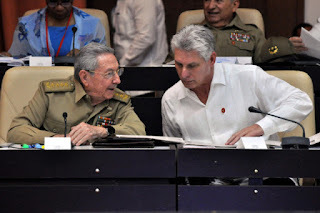 During his political journey, the newly appointed Cuban president, Miguel Mario Díaz-Canel, has prospered without running, without heterodox initiatives because it was not necessary, his destiny was marked. He never strayed from ideological dogmas, nor are he known for reckless reformist proposals. During the elections for deputies of the National Assembly last month, Díaz-Canel paid tribute to the historical generation that has led and that forged the revolution. Diaz-Canel's speech has been dogmatic, predictable. Barely involved in political activism, he has not hesitated to keep up with the digital ones he considers hostile, trained by counterrevolutionary, social democratic tools, which in the nomenclature of the party is similar. The certain thing is that the new head of government, with the accompaniment of Raul Castro in the general secretary of the PCC, will keep blocked the political opening, and they will extinguish any attempt to force it. All the governments and societies that demand a democratic transition in Cuba, would like the new president, Miguel Díaz-Canel, to be a renegade, to swear falsely. The entire European Union and the majority of the UN General Assembly would applaud the 57-year-old engineer who replaces Raúl Castro, promised to respect the fundamental principles of the 1959 Revolution, and gradually recant them, which was the Adolfo Suarez Antillean however, observing its character, incompatible with political daring, and an orthodox trajectory in the Communist Party (PCC), apostasy is not foreseeable. Born in 1960 in the province of Villa Clara, married twice and with two children from his first marriage, Miguel Mario Díaz-Canel moderated ideology in the communist youth. His ascension to the skies of the regime was rapid. The army general, Raúl Castro, incorporated him in 2003 to the political bureau of the PCC, where important decisions are made, cook, and continued his training as secretary of the party in the province of Holguín. Six years later, he is summoned to inform him of his appointment as Minister of Education. In 2012, he becomes vice president of the Council of Ministers. A year later, the master's degree in revolutionary governance and the 21st century is completed with the position of vice president of the Council of State.He is not inexperienced in organic matters, he knows intrigues. He does not look like a brittle man because if he had feared that he was another, it would be his destiny.As Fidel Castro once explained, there were several leaders who let themselves be tempted by the siren songs of those who revived them to accelerate democracy in Cuba, those who today continue in relegation, living off revolutionary charity. Carlos Aldana, Carlos Lage, Felipe Perez Roque, and other ministers and vice presidents, who were companions of the Castro brothers for many years, fell into misery when they were caught flirting with Western democracies, with the honeys of power. The punishment of Lage, 65, a former vice president of the State Council, was comparatively dignified: he resided in entrusting the campaign against the Aedes aegypti mosquito in a polyclinic in a Havana municipality. Others did not have that luck.Diaz-Canel is made of another type of wood. He is not a foreigner, nor an improvised, nor a martyr for the freedom of Cuba. Certainly, his road map to the future is yet to be seen, but the route traveled in the circuits of the party and the institutions do not allow him to venture into his plans or betrayals of the cause, nor proposals for free.